What is a risk-limiting audit, and how do you perform one? An RLA is a human inspection of a random sample of the paper ballots (or batches of ballots)—using a scientific method that guarantees with high confidence that if the voting machines claimed the wrong winner, then the audit will declare, “I cannot confirm this election,” in which case a by-hand recount is appropriate. This is protection against voting-machine miscalibration, or against fraudulent hacks of the voting machines. That’s what it is, but how do you do it? RLAs require not only a statistical design, but a practical plan for selecting hundreds of ballots from among millions of sheets of paper. It’s an administrative process as much as it is an algorithm. In 2018, RLAs were performed by the state of Colorado. In addition, two just-published reports describe pilot RLAs performed by Orange County, California and Fairfax, Virginia. From these reports (and from the audits they describe) we can learn a lot about how RLAs work in practice. Orange County, CA Pilot Risk-Limiting Audit, by Stephanie Singer and Neal McBurnett, Verified Voting Foundation, December 2018. Neal Kelley, Registrar of Voters of Orange County, ran an RLA of 3 county-wide races in the June 2018 primary, with assistance from Verified Voting. 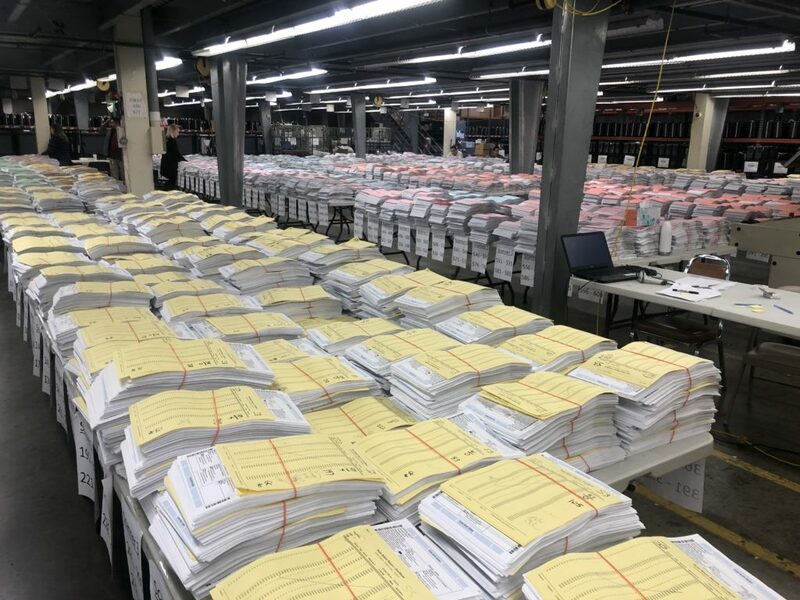 About 635,000 ballots were cast; many ballots were 3 pages long (printed both sides), about 1.4 million sheets overall. Of these, just 160 specific (randomly selected) ballot sheets needed to be found and tabulated by human inspection. How do you manage a million sheets of paper? Like this! Keep well organized ballot manifests that list each batch of ballots (that were initially counted by optical scanners), where they came from, how many ballots. How do you know how many ballots are in each batch? The optical scanners tell you, but you don’t want to trust the optical scanners (a hacked scanner could influence the audit by lying about how many ballots are in a batch). So you weigh the batch on a high-precision scale, that tells you ±2 sheets. And so on. You can read the details in the report, which really helps to demystify the process. Still, there are many ways of doing an RLA, and this report describes just one of them. The audit was finished before the deadline for certifying election results. The estimated salary cost of the staff of the Registrar of Voters, for the days running the audit, was under $4000. City of Fairfax,VA Pilot Risk-Limiting Audit, by Mark Lindeman, Verified Voting Foundation, December 2018. Brenda Cabrera, General Registrar of the City of Fairfax, ran a pilot RLA of the June 12th 2018 Republican primary Senate election, with assistance from Verified Voting. There were 948 ballots cast, and the audit team ran the audit three ways, to test three different RLA methods. The audit was scheduled to take two days but finished ahead of schedule. Colorado ran statewide RLAs of its 2018 primary and general elections, after pilot projects in previous years. From all these activities we continue to learn more about how to run trustworthy elections. I encourage state and local election officials nationwide to try RLA pilots of their own. The Verified Voting Foundation, Democracy Works, the Democracy Fund, Free and Fair, and other individuals and organizations are available to provide advice. Ballot-marking devices (BMD) contain computers too, and those can also be hacked to make them cheat. But the principle of voter verifiability is that when the BMD prints out a summary card of the voter’s choices, which the voter can hold in hand before depositing it for scanning and counting, then the voter has verified the printout that can later be recounted by human inspection. 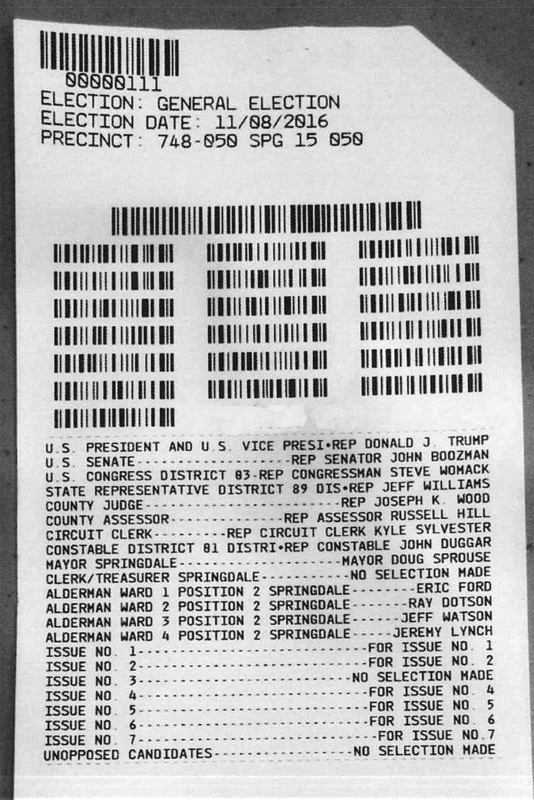 ExpressVote ballot card, with bar codes for optical scanner and with human-readable summary of choices for use in voter verification and in recount or audit. But really? As a practical matter, do voters verify their BMD-printed ballot cards, and are they even capable of it? Until now, there hasn’t been much scientific research on that question. In a real polling place, half the voters don’t inspect their ballot cards, and the other half inspect for an average of 3.9 seconds (for a ballot with 18 contests!). When asked, immediately after depositing their ballot, to review an unvoted copy of the ballot they just voted on, most won’t detect that the wrong contests are presented, or that some are missing. CITP seeks applicants for various visiting positions each year. Visitors are expected to live in or near Princeton and to be in residence at CITP on a daily basis. They will conduct research and participate actively in CITP’s programs. All visitors must apply online through the links below. There are three job postings for CITP visitors: 1) the Microsoft Visiting Researcher Scholar/Professor of Information Technology Policy, 2) Visiting IT Policy Fellow, and 3) IT Policy Researcher. The successful applicant must possess a Ph.D. and will be appointed to a ten-month term, beginning September 1st. The visiting professor must teach one course in technology policy per academic year. Preference will be given to current or past professors in related fields and to nationally or internationally recognized experts in technology policy. Full consideration of the Microsoft Visiting Research Scholar/Professor of Information Technology Policy position is given to those who apply by the end of December for the upcoming year. A Visiting IT Policy Fellow is on leave from a full-time position (for example, a professor on sabbatical). The successful appliant must possess an advance degree and typically will be appointed to a nine-month term, beginning September 1st. Full consideration for the Visiting IT Policy Fellow is given to those who apply by the end of December for the upcoming year. An IT Policy Researcher will have Princeton University as the primary affiliation during the visit to CITP (for example, a postdoctoral researcher or a professional visiting for a year between jobs). The successful applicant must possess a Ph.D. or equivalent and typically will be appointed to a 12-month term, beginning September 1st. This year we are also looking for a postdoctoral fellow to work on bias in AI in collaboration with an interdisciplinary team: Arvind Narayanan and Olga Russakovsky at Princeton and Kate Crawford at the AI Now institute NYU. We are interested in developing techniques for recognizing, mitigating and governing bias in computer vision and other modern areas of AI that are are characterized by massive datasets and complex, deep models. If you are interested specifically in this opening, please mention it in your cover letter. Full consideration for the IT Policy Researcher positions is given to those who apply by the end of December for the upcoming year. Applicants should apply to either the Visiting IT Policy Fellow position (if they will be on leave from a full-time position) or the IT Policy Researcher position (if not), but not both positions; applicants to either position may also apply to be the Microsoft Visiting Research Scholar/Professor if they hold a Ph.D.
All applicants should submit a current curriculum vitae, a research plan (including a description of potential courses to be taught if applying for the visiting professor), and a cover letter describing background, interest in the program, and any funding support for the visit. References are not required until finalists are notified. CITP has secured limited resources from a range of sources to support visitors. However, many of our visitors are on paid sabbatical from their own institutions or otherwise provide some or all of their own outside funding.